I'm so so so so so so excited to announce the arrival of the Conchoidal MKAL in collaboration with House of A La Mode Fiber Goods. This MKAL is a sock MKAL (mystery knit along) where all you know is that you'll be making socks, cuff down, two at a time (2aat) and that they'll ROCK! Literally! Conchoidal (or subconchoidal) is the fracturing habit of the topaz family of gemstones. And since the name of the colorway in which I designed the socks is "Topaz", it seemed only fitting that the design itself be named appropriately. Now... if you do some reading up on "conchoidal" and you learn that the fracturing habit is actually due to stress put on the stone... don't equate that to this MKAL. This is a no-stress knit along - lots of photo and video tutorials abound to get you through. Plus... all access to ME to answer all your burning sock questions! It doesn't take much! Download the pattern from Ravelry, grab some yarn (House a A La Mode has dyed up a bunch of gorgeousness for this MKAL and her shop update is live at 10am today, PST) and say "Hello" to all your fellow sock knitters in my Ravelry Group: The Unapologetic Knitter. The pattern, available for download now, will be pushed out to you for 4 consecutive Fridays, beginning on Friday, March 23rd. Each week we'll learn a new skill and on week 2, the full pattern is revealed. The initial download when you purchase your pattern gives you an eensy weensy bit of homework to get you prep'd for the MKAL start date in just 10 days! I hope you'll join me in some sock-knitting awesomeness! I have a love/hate relationship with the end of a KAL. I love it because I know that it means that we've all made something we love (at least I HOPE you love it). It also means I can start planning my next MKAL! YAY! But I hate that we'll stop chatting about your WIPS. So here's my sad-sack plea: post your FO's in the Ravelry Spoilers thread and share the love with everyone! I can't wait to see them all! Ok? Thanks! This week isn't a very long clue but it may take some time if you're used to knitting on the circular needle. Moving to DPNs isn't hard, just fidgety. IF you are comfortable with the Magic Loop technique you make find it easier than DPNs if you're not a DPN user. If you haven't been working on DPNs this whole time please remember to move the working yarn to the front each time you change needles on the BRP rounds (Rnd b) so that you can work the sl1yo properly. You don't want to start losing stitches now. In this final clue, we're working shaping to finish the hat. We will work in brioche until the last two rnds where we work in standard knitting to close up the gap. So here's a video on how to change from brioche back to regular knitting. If you're using Ewe Ewe Yarns Wooly Worsted let me know and I can send you a few extra yards to tide you over. You can finish off the hat in 1-color. You could work Rnds a and b in Color C only. It's a funky hat so the funk of using a solid color at the end won't hurt. Ok - there's a third option - substitute Color A back in for Color B. See the above reason re: "funky". No matter what the case - I don't want you to be high and dry without the yarn you need. Weaving In - Say What? Starting with the top of the hat, where we have colors B and C cut after closing the hat: weaving in the ends is actually fairly simple. I put both threads from the top of the hat into (onto?) my tapestry needle and snug the top closed by weaving the working yarn ends through the live stitches. Next, weave those ends in carefully to hide them so that if I want to turn my hat inside out, I can. When I say "carefully" I mean I created duplicate stitches on the purl side of the work. I don't see any ends, do you? Weaving in the ends on the brioche rib can be crucial. As one of the awesome benefits of brioche is that it's fully reversible if you work it correctly (which I'm pretty sure we all have), weaving in the ends becomes very important. The method that works the best is "hiding" the ends rather than "weaving" anything. I tend to "hide" the ends in over 10 or so rows so I won't get the yarn pulling out when I wear it. Below the next very important note I have a video to show you how I weave in the ends on brioche. DON'T CUT YOUR ENDS UNTIL YOU'VE BLOCKED THE HAT! Once your ends are woven in, leave the tails in place until you've blocked the hat. This way if any shifting occurs during blocking, as it can do, you won't have wonky ends that you can't weave in for being too short. So, before trimming them, block the hat! 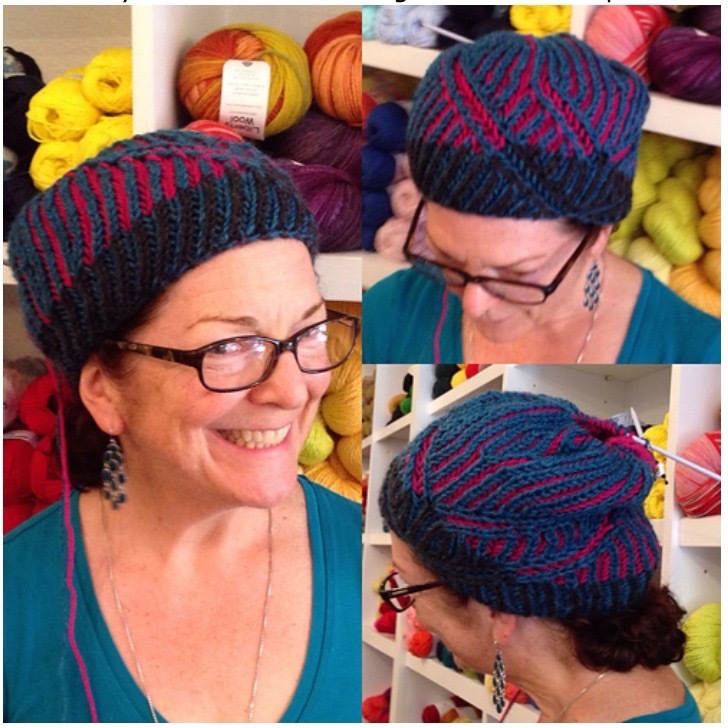 Blocking - A Tip for Hats! I know we all love to wear our FO's right away but rarely is a project ready for wear without blocking. Some hats are ok (I might have a Sockhead hat or two lying around that was never blocked) but brioche requires it (in my not-so-humble opinion). HOWEVER! We don't want to stretch out the brioche too much. So, here's my recommended steps to take to help you block the hat appropriately for this fabric (put away those blocking pins now!). Step 1: Soak the living daylights outta that hat! Ok, that's not actually required, but you will want to wet block the hat. I have a blocking bowl that I use for hats so I don't have to run too much water in a sink or tub. Use cool water and a wool wash (my favorite is Soak). Let the hat sit for at least 15 minutes so that the fibers get fully saturated. Step 2: Squeeze the water out. SQUEEZE! Don't wring! I end up usually just pushing it against the side of the wash basin so I don't twist it in any way. TIP! If you find the hat hard to squeeze because of it's size, use a tea towel, lay the hat in the towel, roll it up, and step on it a bit. This pushes the water out without twisting anything. Step 3: Lay the hat out flat in this crazy configuration. Why? Well, because 2 things: the first is that this way the crown of the hat gets the much needed stretch that it should have to show off the ribbing WITHOUT stretching out the brim which was knit on smaller needles for a reason. And secondarily, it flattens out the crown which can get a bit wonky with decreases and brioche shaping. PLEASE don't put a plate or any kind of round item in the hat. I know this is common practice for blocking hats, and I agree with it in most cases. But because of the stretchy nature of brioche, you can OVER block it and then you'll have a big ol' mess of hat on your hands. Lay it out in what looks to be a reasonable shape and size (it is a bit oblong, not fully round) and just let it dry. All. The. Way! I don't want to post anything that spoils the hat here (although, really, we're pretty clear on what it looks like at this point, right?) so I won't post a finished picture until next week. But THANK YOU all for knitting (pardon, brioche-ing) along with me on this MKAL. It's been an absolute pleasure interacting with you all, watching your brioche skills excel, and helping you sort out issues. 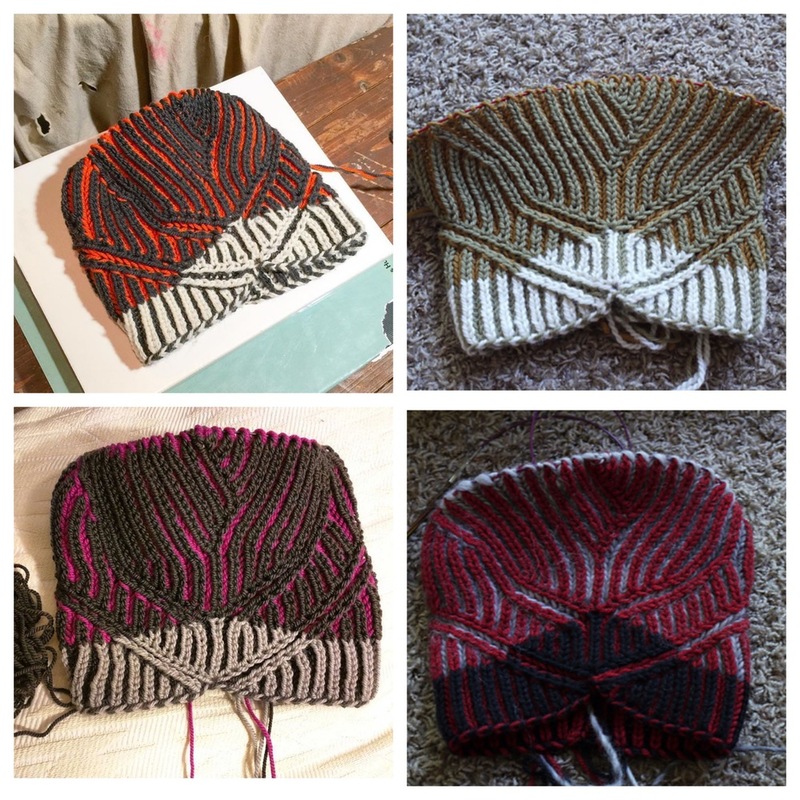 I hope this helped you learn enough that you're confident and can face any brioche project. I'll be monitoring the Ravelry Discussion Group for another week or so regularly. Beyond that if you have questions (I'm not disappearing, just won't be checking every 20 minutes or so) that you need an answer to ASAP, ear burn me. To do this enter my username in square brackets and follow it by tying the word "person" in parenthesis: [socalmeaghan](person). Good luck with the FO's. I can't wait to see them in the Spoiler thread!